White New Jersey Latina viciously beaten by black Muslimah — 1389 Blog - Counterjihad! None of the news media websites mention the race or ethnicity of the perpetrator or of the victim. That information must be gleaned from the names and photos. Had the reverse situation been true – in other words, had a white Hispanic injured or killed an African-American in a severe altercation – the media and the politicians would have used the racial identities to claim a motive of white racism. We remember the Trayvon Martin case – that’s how they roll. Note that the evidence available as of this writing does not suggest that this particular beatdown was primarily motivated by black racism. I also observe that the media posted a photo obtained by the Salem, NJ police showing the accused wearing a hijab. Only a Muslimah wears a hijab. The hijab is the female uniform of the Muslim Brotherhood. The accused was not wearing a hijab, but rather, an ordinary McDonald’s uniform, in the video of the attack. 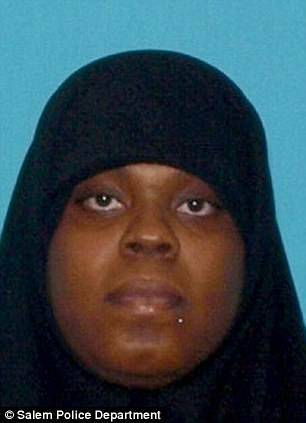 According to an article in the Daily Mail (UK), the accused, Latia Harris, also goes by the Islamic name Alima Zawjatul Abdul Sabur. That piece of information is missing from the US papers. The accused is charged, not only with assault, but also with terroristic threats. Exactly what were those terroristic threats? Islam is catnip for angry people in general, and for crazy angry people in particular. The only thing we can say for sure at this time is that we are not being told the whole story. What about the pretext that Harris assaulted Ferreira out of fear of losing her job? Harris walked off the job during working hours to administer a beatdown to a former co-worker, and then went on the lam. How would that help her keep that job? Doesn’t make sense. Previous post: What are non-Muslims doing in the Kingdom of Saudi Arabia in the first place?